ConceptDraw DIAGRAM is the beautiful design software that provides many vector stencils, examples and templates for drawing different types of illustrations and diagrams. 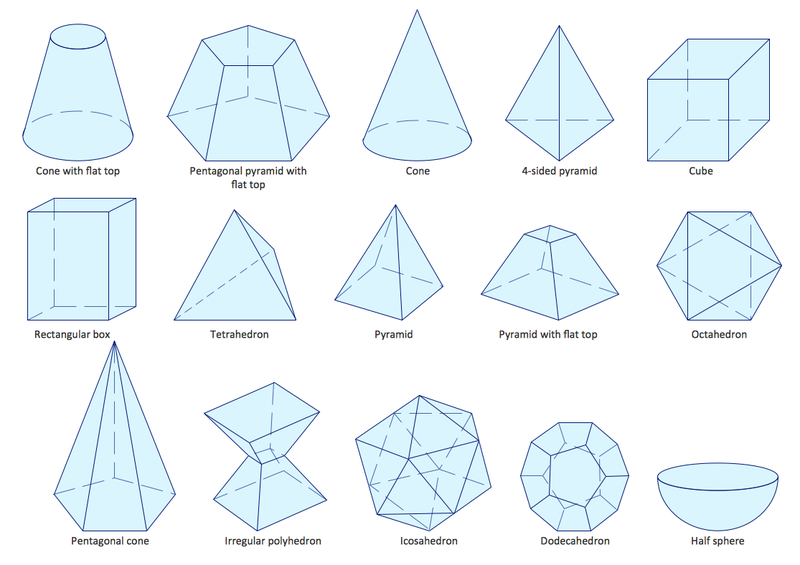 Solid Geometry library from Mathematics Solution contains 15 ready-to-use vector objects of geometric figures. This Scientific Symbols Chart shows the objects of geometric figures of the Solid Geometry library. Use ConceptDraw DIAGRAM diagramming and vector drawing software with Mathematics Solution to design your own mathematic illustrations quick and easy. The documents of ConceptDraw DIAGRAM ector graphic documents. They are available for reviewing, modifying or converting to a variety of formats: image, HTML, PDF file, MS PowerPoint Presentation, Adobe Flash or MS Visio.